While relatives have claimed Abu Thraya lost his legs in an Israeli airstrike while trying to rescue people, AP records show that he was wounded on April 11, 2008, in a clash between Israeli forces and Palestinian militants in the Bureij refugee camp in central Gaza. AP television footage from that day shows Abu Thraya identifying himself as he is taken away on the back of a pickup truck. He is also seen being taken on a stretcher. Less than two weeks after he wrote this, the army’s criminal investigation unit announced that it would investigate the circumstances of the death of Ibrahim Abu Thuraya, a double amputee. Following CAMERA’s communication with Haaretz about this discrepancy in the English edition versus the Hebrew edition, along with a tweet today on the subject, editors have commendably corrected the English version. In the amended article now appearing on the site, editors removed the misleading reference to an air strike. 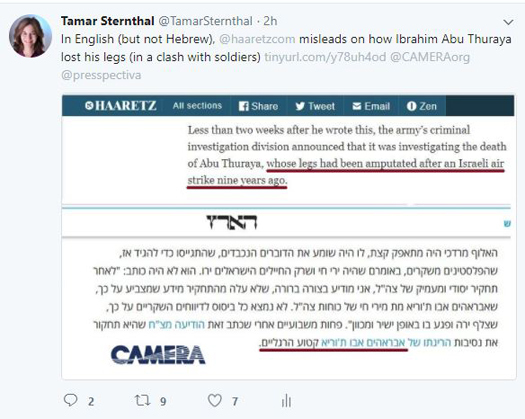 The English edition now parallels the Hebrew version, accurately referring to “double-amputee Abu Thuraya.” Contrary to common journalistic practice, editors did not append a note alerting readers to the change. For additional cases of “Haaretz, Lost in Translation,” or instances in which misinformation about Israel appears only in Haaretz‘s English edition, but not in the parallel Hebrew item, see here. 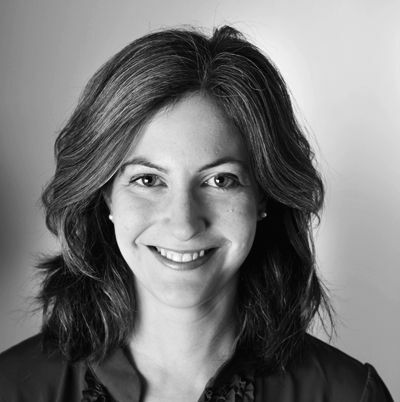 For additional Haaretz corrections prompted by CAMERA and Presspectiva, CAMERA’s Hebrew site, please see here.